Injury caused by alkalis can be divided into three phases based on their tissue histopathological response [Table 1]. These phases of injury are not as distinctly demarcated in acid injury. Acids cause an immediate burning sensation in the mouth and this by itself limits damage, as the person stops ingesting it. An upper GI endoscopy is the single most important prognostic factor in caustic injuries of the esophagus. The current recommendations state that it should be performed within 12–48 h after the ingestion of the agent. Gentle insufflation, adequate sedation, and caution are mandatory to avoid an iatrogenic perforation of the friable esophagus. Endoscopy is contraindicated if there is any suspicion of perforation or if the airway is not secure. Third-degree burns of the hypopharynx or burns involving the supraglottic area and epiglottis are relative contraindications. Endoscopic classification of caustic injuries proposed by Zargar has been shown to have prognostic significance. [Table 2]. CT scans of the thorax can provide detailed evaluation of the injuries. 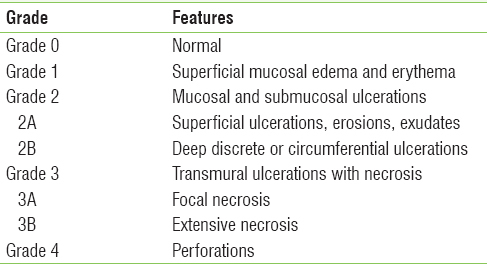 A grading system based on the CT findings [Table 3] has been proposed for caustic lesions of the esophagus. Assessment of the colon with CT abdomen/colonoscopy/barium enema. Sabiston DC, Townsend CM. Sabiston Textbook of Surgery: The Biological Basis of Modern Surgical Practice. Philadelphia, PA: Elsevier Saunders; 2012. Ryu HH, Jeung KW, Lee BK, Uhm JH, Park YH, Shin MH, et al. Caustic injury: Can CT grading system enable prediction of esophageal stricture? Clin Toxicol (Phila) 2010;48:137-42. Agha FP, Orringer MB. Colonic interposition: Radiographic evaluation. AJR Am J Roentgenol 1984;142:703-8. Postlethwait RW. Colonic interposition for esophageal substitution. Surg Gynecol Obstet 1983;156:377-83. Evrard S, Le Moine O, Lazaraki G, Dormann A, El Nakadi I, Devière J, et al. Self-expanding plastic stents for benign esophageal lesions. Gastrointest Endosc 2004;60:894-900.